I came from the northwest part of Bangladesh, and the district where I belong is called Joypurhat. Joypurhat is a district of tropical climate, which is not so big, and my hometown is a small town called Panchbibi, a quiet place with many rice fields around. As you might guess, yes, I belong to a farming family. Most of the people in my town are farmers as well. I heard that people in your country consume much more rice than Japanese do. Yeah, like the M-size rice in the shokudou （cafeterias）, I can consume 3 or 4 bowls at one time. We eat a lot of rice with some curry, Bangladeshi curry, and we use hands, mostly. General people use hands, but some people use spoons and forks. But traditionally, hands are OK. In our family, we also use hands. Do you like Japanese rice? Well, Japanese rice, Japonica. It’s sticky, and it’s totally different from Bangladeshi rice. In the beginning, of course I didn’t like it because I like non-sticky rice. But after a few months of eating it, I got used to it. What I feel about the Japonica rice now is that it’s sticky but it’s not bad. I usually cook Bangladeshi dishes, like curry, with fried rice or something, but Japanese rice (short grain) does not go well with those dishes. It’s better for Japanese food such as sushi. By the way, what brought you to Japan? Well, when I was studying agriculture in my university, Sher-e-Bangla Agricultural University, some of my teachers got the Japanese government scholarship and went to Japan for their PhD. So, it looked like a very, very nice opportunity to me. And when I was in the first or second year of my undergraduate program, I thought about applying for this scholarship because if I get this scholarship, it means that I am a good student. And if I could obtain my Masters or PhD in Japan, it can create great job opportunities for me because in the future, as I want to be a researcher or faculty member of a university in my country. 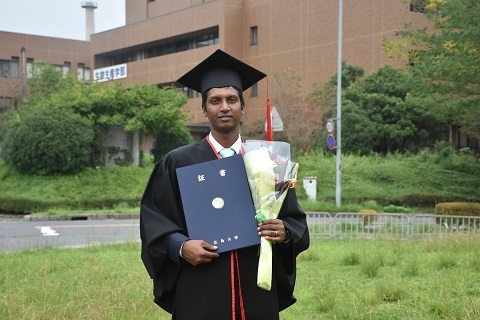 In the beginning, I didn’t think about Hiroshima University because I just wanted to get the Japanese government scholarship and study in any university in Japan. But one day, a member of my faculty gave me a business card of one professor from Japan, and I was told that the sensei was looking for some students from Bangladesh. I contacted him through email, and the sensei asked me what I want to work on, what I want to do in the future. I talked about my research plans and my publications. Then he gave me permission and helped me to apply. My current research is about rice plant and weed management. I’m looking for some chemical compounds from rice plants that can be used as a natural herbicide or weed-killer. Chemical compounds, from rice plant? Yes. There are many different kinds of weeds in the rice fields. So, I’m looking for some solutions from the rice plant research. For example, after we cut the rice, we throw away the plant part. We only use (eat) the grain. So I’m looking at the part we throw away as it contains many kinds of chemical compounds that we can use, and then apply it to control grasses. It is called ‘allelopathy’ (spelling out the word). It’s a field of weed science. ‘Weed’ means unwanted plants in rice fields or other places. Like in the hills there are many types of plants, but there’re some plants that we don’t want. They are unnecessary, unwanted, and very tough. 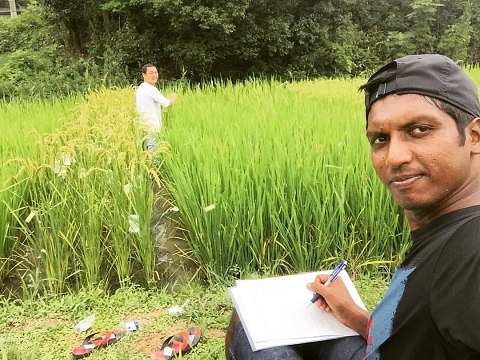 Right now, I’m only doing research on weeds inside the rice field. Many farmers spend too much time and effort just to remove weeds from their fields. Also, there is another basic problem. For weed control, we use a lot of synthetic chemicals, which is not good for environment and can create health hazards. In our lab, we are working on something natural, not synthetically produced and hopefully not harmful after use. It can hopefully be more effective than the common chemical herbicides. I am looking for something that doesn’t harm the farmers or the environment. Are there any Japanese students in your laboratory? This semester we have only one. In IDEC we don’t have so many Japanese students, especially in the Department of Development Technology. But when I attend some common classes, I meet a lot of students from other departments including Japanese. Japanese students, in my understanding, they’re easygoing. And a little shy to speak. But if everything goes well, once they open up, they become much easier to talk to. And I found it is much easier to work with Japanese group mates compared to an international group because with Japanese students, we can always negotiate and decide on something. But between us international students, in my view, it is harder to negotiate. Most Japanese students don’t stick to one point, they always try to negotiate. ‘OK, this one is not working, let’s try another thing’. Like in my case, if I thought this is good, I say ‘we should do this!’ So what I learned from this group activity is that we should be flexible in order to achieve something. It applies to any group activities, like a group project or presentation, because everybody’s decision cannot be the same. But we can always find some common words. In that sense, I was lucky that I had group projects in many classes. I see. Have you gotten used to research life in Japan? Daily life in Hiroshima University is a little bit busy. My sensei prefers that we come to the lab regularly and on time. So I must study at the lab all day long even when I don’t have any particular work for my research. And we must try to learn as many instrumental methods as possible. My sensei wants us to practice self-development and work with other members collaboratively as a group. Our sensei is a very kind and capable man and always encourages every student to get the best out of them. We have many lab activities apart from research activities to ease our pressure and become comfortable. We always help each other in our lab to achieve something. And we have some field experiments where we cultivate rice. So, everyone will go and cut grasses, and plant rice, and then clean the field. After that, we will cut the rice. It’s mostly group work and we learn new methods for new things. So my daily life is busy. Even when I don’t have anything (for my research), I am busy. I am always reading, working, and learning every day. Hasan san, have you ever experienced culture shock in Japan? Yeah, my biggest shock is that nobody in Japan wants to talk about what they really think even though we are friends. I mean, I can express my feelings to friends to get solutions or something. But here, it’s a little bit different. Even though I have some friends here, sometimes I don’t feel like we are really friends. I have many friends in Bangladesh whom we can talk about many things in general or something specific but most of my Japanese friends prefer not to say (what they really feel or think). One of my Japanese friends said that if somebody says ‘maybe’, it means ‘no’. So it is one of the problems I face, because maybe I misunderstood many people. In my understanding, ‘maybe’ is ‘maybe’, ‘no’ is ‘no’, ‘yes’ is ‘yes’. So, in that sense, one or two friends may think that I am rude because if I think it’s ‘no’, I say ‘no’. But maybe in Japan, I shouldn’t say ‘no’ because it’s rude. From this point of view, I sometimes feel like I should be more like… but, ‘no’. I shouldn’t change my view. So that is one problem I face, but now it’s getting a little easier because if I don’t understand, I just let it go or take it easy. For some of my Japanese friends, after they become good friends, they tell me ‘you are rude. You shouldn’t say like this!’ Now I hope I understand a little bit more because of them. But at first it was difficult. I didn’t have enough friends, I only had international friends. 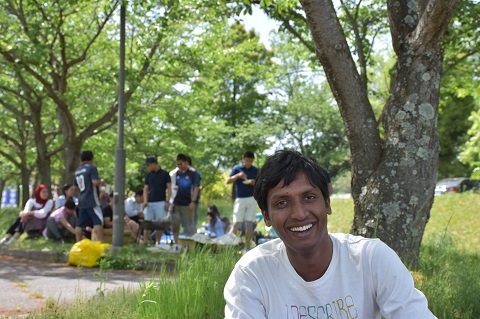 Especially after becoming a member of the Hiroshima University International Students Association (HUISA), I met a lot of people, including Japanese friends, and they gave me the chance to understand the different minds and how to approach such people. What to say, and what not to say. Speaking of HUISA, what kind of activities are you engaged in? I am very lucky because last semester I served as the president of HUISA where I was able to run many activities. Before that, I was the vice president for one semester. 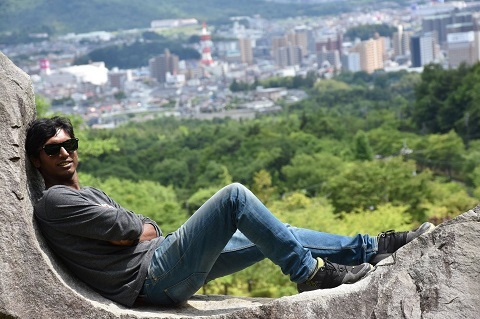 In the previous sakura (cherry blossom) season, we went trekking to Ikoinomori Park. After that, we had one more sakura-viewing party in Kagamiyama Park near the University. In February this year, we had a bus tour to Mominoki Shinrin Koen (Mominoki Forest Park) in Hatsukaichi City where around 100 participants enjoyed snow activities such as snow sledging, snowball fights, and snowman building. I understand that you are married and your wife is Japanese. How is family life? Family life is fine. She is cooperative. We discuss, we always discuss and try to understand each other. Right now, I am learning Japanese and she is learning Bangla also. So I sometimes talk with her parents in Japanese, just a little bit. And she also talks to my family and friends in Bangla. Maybe in a few years, we can acquire each other’s language better. As for family life, we are open (to any possibilities). We want to travel together to new places and enjoy different cultures. 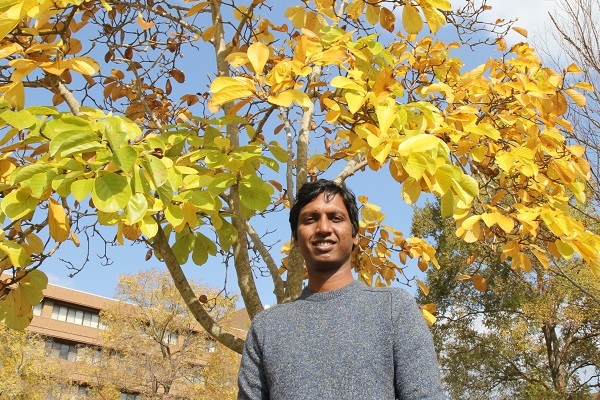 Do you have any advice for younger people in Bangladesh who are thinking of studying abroad? For Bangladeshi students, I think they should work hard and try to search for the right scholarships. Japanese government, JICA, and even Hiroshima University provide scholarships. So I think it is better to find some opportunities for scholarships so that when they come here, they can focus on their studies and don’t have to worry about paying the tuition fees. Otherwise they have to work hard doing part time and study hard to get good results. Especially for Bangladeshi students, we need good results for our future. Lastly, could you tell us your dream? As I mentioned earlier, I want to be a researcher. It is OK as long as I can do my research. It can be in institutes or universities, as long as I can work on my field. I don’t want to leave this field because I have been working on it for six years. So my dream is to be a researcher and to contribute to the society, the Bangladeshi society, and maybe the world through my work. Thank you very much. That concludes our interview. I hope your dreams come true. I hope so, maybe. Thank you very much.